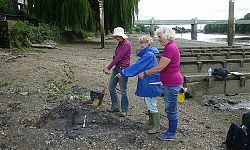 From the 23rd to the 29th of August, a large team of TDP Foreshore Recording & Observation Group (FROG) volunteers undertook fieldwork on the foreshore at Strand-on-the-Green in Chiswick, West London. 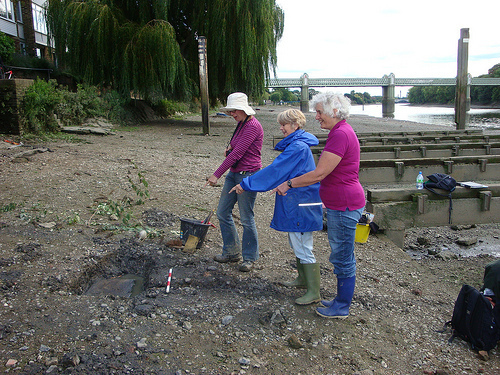 A smaller number of FROG members were working on the opposite side of the river at Kew, recording and sampling a possible Tudor jetty and medieval or Saxon fishtrap found on the foreshore there. The drain itself appeared to post-date the masonry wall, where bricks of possible late 18th century date have been identified. These earlier riverfronts were probably replaced by the precursor to the modern river wall in the late 18th century; in some places its courses were visible below the current wall, suggesting that the foreshore has dropped since that period. This river wall appeared to have been repaired in parts during the mid- 19th century, before the whole visible extent was demolished and rebuilt in its present form. As the foreshore dropped in years after, the lower, earlier and weaker courses were exposed and concrete was lain down to protect them from further erosion. 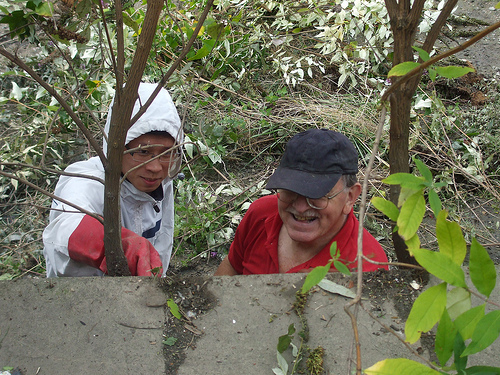 Before the concrete repair, two timber structures were built against the river wall. The first is most intriguing; although of a size which could suggest a river stair or small jetty, it was clad in planking- which is most unusual. The planking was presumably to keep something either outside of or within the structure – our current hypothesis is that it was for keeping live eels or fish in during low tides – but we are open to any suggestions! Adjacent to and later than this structure was a row of timber piles. A number of local residents bought along a number of old photographs to show us, which suggested that the piles were placed to retain a small pontoon with what looked like a shed built on it. Given how close it was to the precursor to the current PLA gridiron, it could have been a tea hut for thirsty barge repairers! 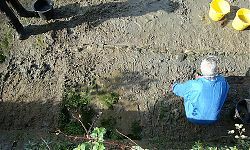 Further to the west, a small section of Tudor river wall was identified and will be fully recorded on subsequent visits. What is most intriguing about these discoveries at Strand on the Green is that, unlike most of the Thames foreshore, which was not subject to heavy bombing in World War Two, they do not relate to the current property boundaries on the riverbank. One local resident who has carried out extensive research into the historic wills and property deeds of the area suggested that the property boundaries here may have been considerably more fluid than elsewhere. As ever with archaeology, our fieldwork here has raised as many, if not more, questions than it has answered; and, as ever, further research is required!